1. Heat 20 tablespoons butter in light colored skillet, swirling constantly, until dark golden brown and has a nutty aroma. Stir in remaining 8 tablespoons butter. Set aside to cool. 3. Mix together sugar and 1/2 cup brown sugar. Set aside. 4. Mix together flour, soda, baking powder and salt. Set aside. 5. Mix together 3 1/2 cups brown sugar and cooled butter just until combined. 6. Stir in eggs, egg yolks and vanilla, just until combined. 7. Stir in flour mixture, just until combined. 8. Form into balls about 2 tablespoons in size. Roll dough balls in sugar/brown sugar mixture. 9. Bake 12 to 14 minutes until edges are just browned and set but centers are still soft. 1. I have browned the butter in a skillet, as they recommend, and in a sauce pan and the skillet it better. 2. 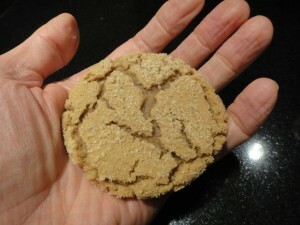 I never looked for “dark brown sugar” but just used the brown sugar from Costco. 3. Consider dipping them in the same chocolate/shortening mixture used in the Cocoa Puffs recipe. No wonder you bake cookies.